Initial study results show the promise of this new-generation DCB in complex lesions. The Legflow device is available under CE Mark only and is not approved in the United States. Lower extremity peripheral artery disease is estimated to affect more than 200 million people globally, and this number will increase with greater prevalence of atherosclerotic risk factors and aging populations worldwide.1,2 However, recent innovations in vascular intervention have greatly improved the ability to reduce suffering for patients and lessen the risk for severe consequences such as amputations. Drug-coated balloons (DCBs) are one of the major advances in the endovascular treatment of superficial femoral artery (SFA) occlusive disease. Several proof-of-concept trials and multiple randomized pivotal trials have shown treatment with DCBs to be safe and effective for treatment of atherosclerotic disease in this important field of vascular medicine. Meta-analyses confirm consistently greater benefits with DCBs than with control treatment.3 However, many questions remain: What if we look at more complex, longer TransAtlantic Inter-Society Consensus (TASC) C and D lesions? Is there any difference between claudicants and critical limb ischemia (CLI) patients? What is the ultimate role of calcium? When do we need scaffolding? Is the DCB effect different after intraluminal versus subintimal recanalization? In challenging TASC C and D lesions, high rates of successful recanalization exceeding 90% can now be achieved with advances in endovascular technology (eg, crossing catheters, reentry devices, guidewire technology, two- and three-dimensional imaging fusion techniques) and improved operator skills (eg, alternative accesses, combined approaches). Therefore, optimizing the definitive treatment that could improve long-term patency and clinical outcomes plays a crucial role in this area. Well-known endovascular solutions for long and complex SFA lesions include implantations of modern-generation nitinol stents, drug-eluting stents, and stent grafts. However, long-segment lifelong metal implantations create many disadvantages, especially in-stent restenosis (ISR). In some single-arm studies, DCBs show promising results,4-6 but the evidence gap is still highly relevant to real-world experiences. As there is a lack of head-to-head comparisons between different DCBs and there is no class effect, there is no consensus as to which DCBs specifically are suitable for long lesions. The performance of a DCB relies on three important pillars: the balloon platform, the stability of the coating matrix, and drug-tissue transfer and residency. The Legflow paclitaxel (PTX)-releasing peripheral balloon (Cardionovum GmbH) seems to score high on all of these three elements. Because of the used balloon platform, the balloon tracks well, is highly pushable, and has outstanding maneuverability. These characteristics, in combination with the availability of a 200-mm length, make the Legflow a highly appealing option for long SFA lesion treatment. The balloon platform is also designed to allow high inflation pressures (to break, score, and sculpt heavily calcified plaques) with a homogeneous inflation, which ensures good vessel wall apposition. Figure 1 shows a long popliteal occlusion before and after treatment with the Legflow DCB. Figure 1. Preoperative (A) and post-predilatation angiograms (B) of a popliteal occlusion. Dilatation with the Legflow DCB (C), and final result after treatment with the Legflow device (D). The coating matrix is a second consideration. To survive all kinds of handling, insertion, tracking, and lesion crossing, especially in longer lesions, coating stability is key. Homogeneous drug release is essential to avoid either spot restenosis from too little drug released in certain areas or microaneurysms from PTX release that is too concentrated. The Legflow device uses SAFEPAX coating technology, a third-generation mixture based on an ammonium salt compound that is hydrophobic during catheter tracking to the lesion site and lipophilic when the balloon is inflated. The excipient matrix opens and releases the PTX only when the balloon is inflated. The PTX molecules are in a nanostructured order, allowing the homogenous drug release of 0.1-µm drug particles (compared to earlier generations of DCBs that release PTX particles of 2–3 µm) that are easily absorbed in the vessel wall and do not expose the patient to the potential risk of microembolization. Initial results with the Legflow DCB relevant to treatment of long SFA lesions were provided in a recent interim analysis from the RAPID trial, which found numerically higher rates of primary patency with the Legflow DCB plus stent than with stent alone (74.7% vs 62.0%, respectively; P = .273) in patients with an average lesion length of 15.8 cm and high calcification rates.4 A similar consistent trend toward greater benefits with Legflow was noted for clinically driven target lesion revascularization (TLR). Figure 2. 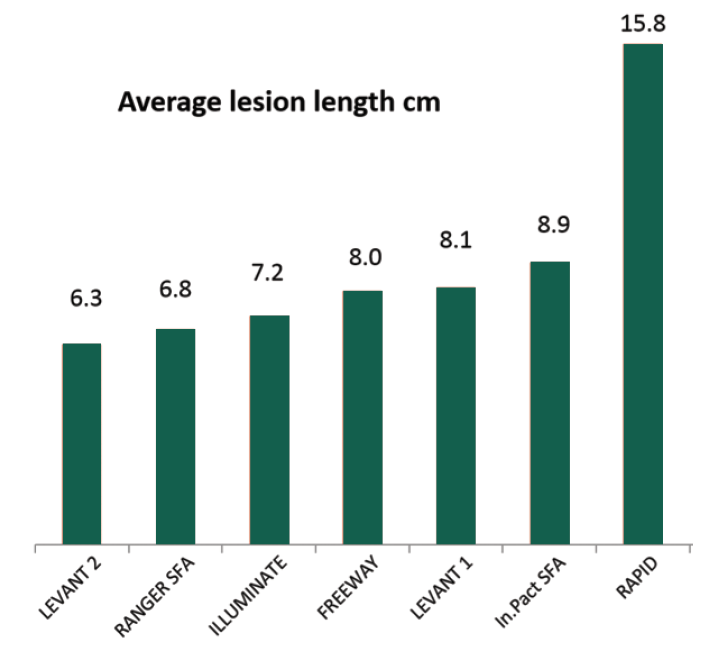 Average lesion length in pioneering controlled trials of DCBs in SFA lesions. This is pioneering work for Legflow in a challenging population and with a market-leading stent (Supera, Abbott Vascular) as benchmark. Most early trials in newly developed balloons studied populations with average lesion lengths of 6 to 9 cm (Figure 2). The statistical power of the interim RAPID 12-month results was too reduced (< 50% of patients had completed 12-month follow-up at the time of the analysis) to detect significant differences between the groups. We eagerly await the final 2-year results from the full population. Both of these studies provide valuable data on Legflow in a range of populations and using various strategies, but neither study focuses specifically on long SFA lesions. The RAPID study included a wide variety of lesion lengths starting at 5 cm and also included bare-metal stent in both groups, which, although relevant to traditional treatment patterns, may not reflect recent developments toward a DCB-only approach. LEG-DEB is providing critical data from real-life treatment situations, including both patients with claudication and CLI. To truly evaluate long lesions and reflect the latest trends in DCB use, the REFLOW clinical trial (NCT02580955) was designed.6 The objective is to investigate the efficacy of Legflow for the treatment of femoropopliteal lesions > 15 cm (TASC C and D lesions). The REFLOW study is a prospective, multicenter, physician-sponsored clinical study. Angiographic inclusion criteria are target lesions > 150 mm considered as TASC C or D lesions as well as angiographic evidence of stenosis > 50% or occlusion that can be passed with standard guidewire manipulation. These criteria ensure a challenging treatment population. The primary endpoint is primary patency at 12 months, and patency at 6 months is a secondary endpoint. TLR will be assessed at 6 and 12 months. Interim analyses presentation from the first 60 patients with 6-month follow-up is expected at the Leipzig Interventional Course in early 2018. This will add to the strongly growing evidence base for the Legflow device. In summary, there is a trend toward drug-eluting technologies, with growing evidence regarding the safety and efficacy over the long term. Interventionalists are also moving toward less metal implantation to overcome the ISR problem. High-performing DCBs with a stable coating matrix and a well-controlled, efficient drug transfer to the vessel wall are extremely well placed to respond to these two trends in treatment, including in longer and more complex SFA lesions. Although preliminary, the Legflow DCB has shown promising results, and more data will be forthcoming to confirm this initial enthusiasm. 1. Fowkes FG, Rudan D, Rudan I, et al. Comparison of global estimates of prevalence and risk factors for peripheral artery disease in 2000 and 2010: a systematic review and analysis. Lancet. 2013;382:1329-1340. 2. McDermott MM. The magnitude of the problem of peripheral arterial disease: epidemiology and clinical significance. Cleve Clin J Med. 2006;73 suppl 4:S2-7. 3. Giacoppo D, Cassese S, Harada Y, et al. Drug-coated balloon versus plain balloon angioplasty for the treatment of femoropopliteal artery disease: an updated systematic review and meta-analysis of randomized clinical trials. JACC Cardiovasc Interv. 2016;9:1731-1742. 4. de Boer SW, van den Heuvel DAF, de Vries-Werson DAB, et al. Short-term results of the RAPID randomized trial of the Legflow paclitaxel-eluting balloon with Supera stenting vs Supera stenting alone for the treatment of intermediate and long superficial femoral artery lesions [published online August 1, 2017]. J Endovasc Ther. 5. Stabile E, Magliulo F, Zhelev D, et al. Interim analysis at 6 months from the LEG-flow drug eluting balloon for the treatment of femoropopliteal occlusions (LEG-DEB) registry. Int J Cardiol. 2016;223:654-655. 6. REFLOW study, investigating the efficacy of the LEGFLOW DCB in TASC C & D fempop lesions. https://clinicaltrials.gov/ct2/show/NCT02580955?recrs=ab&cond=reflow&rank=2. Accessed October 27, 2017. Disclosures: Consultant for Cardionovum GmbH.